Disminución del peso corporal mejora la apnea obstructiva del sueño. 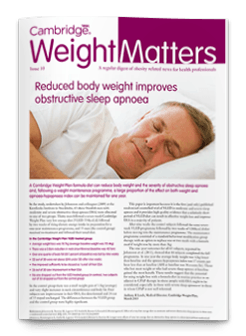 Reduced body weight improves obstructive sleep apnoea. A Cambrdge Weight Plan formula diet can reduce body weight and the severity of obstructive sleep apnoea and, following a weight maintenance programme, a large proprotion of the effect on both weight and apnoea-hypopnoea index can be maintained for one year.